Pisa Italy is famous for its campanile the 'Leaning Tower'. 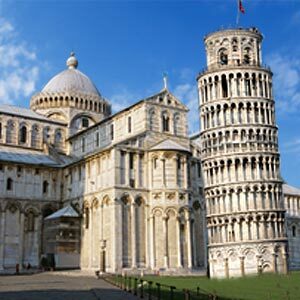 Pisa is equally notable for its long maritime legacy dating to 1000 BC, its prized university and for being the home to the legendary scientist Galileo Galilei. Situated in the heart of Italy, Pisa is a serene and horizontal town and a well-known historic tourist destination in Tuscany. Pisa lies on the mouth of Arno River between Genoa and Rome, about thirteen kilometers from the Mediterranean Sea. Tourists flock to Pisa desiring a peek into its treasure trove of surprises. The bright Lungarni quays walled by noble buildings, the medieval alleys leading to that famous 'Piazza del Miracoli', the splendid ancient history boasting an era of the Marine Republic, Pisa offers much more than a traditionally familiar tourist route. Pisa houses one of the most famous squares in the world comprising four gems - The Cathedral, the Baptistery, the Leaning Tower and the Monumental churchyard. Even a tourist passing through Pisa cannot but admire the wonderful works of architecture and sculpture. The Baptistery dates back to the thirteenth century and is located behind the Cathedral. Different styles of architecture including the Romanesque and Gothic mix can be seen here. The Sansovino baptismal font in white marble which is the work of the great Nicola Pisano dating back to 1502 delights the tourists. The Baptistery is octagonal with a facade in white and green marble evoking the shape of the Holy Sepulcher. The Cathedral is a typical Romanesque building dating back to the 12th and 13th centuries. The Cathedral looks simple with a decorated facade and a marble portico. The interior consists of three naves divided by granite columns. The masterpiece of Italian Gothic sculpture - the beautiful Giovanni Pisano pulpit is awesome. The Monumental Churchyard has gathered the ancient sculptures, sepulchral monuments and works of art. This 'Camposanto Monumentale' of Pisa has progressively become one of the greatest and richest galleries of medieval paintings and sculpture. The great colonnade that opens out on an inner lawn with its great round arches draws the attention of tourists. The fine arches and lancet windows immensely add up to the attraction. The Leaning Tower or simply the Tower of Pisa is the 'campanile' or a free standing bell tower of the cathedral in Pisa city. Although intended to stand vertically, the tower began to lean southeast soon after the onset of its construction in 1174 when layers of heavy marble were placed on a shifting subsoil foundation that has been the bane of Pisan engineers for more than eight hundred years. This beautiful building was originally designed as a bell tower for the cathedral, based on a project by Bonanno Pisano. It was completed during the 14th century. The tower weighs 14500 tonnes and its height is 55.86 m from the ground on the lowest side and 56.70 m on the highest side. The tower has 294 steps. The tower could be seen to lean at an angle of 5.5 degrees. This means the tower is 4.5 m from where it used to stand vertically. The round tower is composed of a base with blind arches which support six loggia tiers. This culminates in an elegant bell chamber. The tower was closed for restoration work in 1990 and opened after eleven years of difficult work in the building and the ground underneath in 2001 to the public. By then, the tower's gradient had been reduced to 40 cm and the building brought back within the safety standards. Visiting hours to the tower vary from season to season. Santa Maria della Spina is a typical small church on the banks of the river Arno. The story goes that a thorn from the crown of Jesus Christ has been preserved here for centuries and exhibited now in the Church of Saint Chiara. The church has elegant spires, tympanums and tabernacles. The Church of San Paolo a Ripa d'Arno is a beautiful one constructed between the ninth and tenth centuries and is a splendid example of Pisan Romanesque architecture. The beautiful chapel of Sant'Agata is located beside the church. San Michele in Borgo built between the tenth and eleventh centuries in a transition style of Pisan Romanesque and Gothic architecture has a beautiful façade above the trusses. A rose window and a tabernacle dating back to the fourteenth century are seen. The church contains various works of art. San Zeno Abbey hosts contemporary art exhibitions and concerts. This is an unusual mix of architectural styles and orientation. Museo della Sinopie contains displays of sketches from the frescoed cycle that decorated the walls of the Campo Santo cemetery. The Museo dell'Opera del Duomo exhibits arabesque panels and Corinthian capitals and the influences of Rome and Islam on Pisan architecture. Museo Nazionale di San Matteo displays a range of Florentine art from the twelfth down to the seventeenth centuries. Leather goods, shoes, terracotta and wooden furniture – shop for these and more at Pisa Italy. The Piazzo delle Vettovaglie surrounded by elegant sixteenth century porticos is the location of the colorful daily market. The Borgo Stretto with its wonderful porticos is the heart of shopping in Pisa. The Corso Italia across the Mezzo Bridge is another shopping address in the city. Pisa is also known for its Antiques Market which offers plenty of furniture and shops. The city center is full of life with restaurants, pizzerias, inns, aperitif bars, discos and live music bars. A vast range of fish restaurants can be found in Marina di Pisa and Tirrenia. Versilia Coast is another hotspot for entertainment bars. This Tuscan territory is particularly suitable for farm holidays, trekking, cycling, horse riding, bird watching, golf, open air and water sports that flourish along the coastline with sandy beaches well equipped with bathing establishments, hotels and restaurants offering international delicacies. The climate in Pisa is mild all year round. Summer is long in Pisa. Autumn and spring are mild. Winter is temperate with little rainfall. Pisa can be easily reached in Italy by car, train and air from abroad. The Galileo Galilei International airport is located in Pisa. This is a prominent airport in Tuscany and connects the city with several major Italian and European destinations. There are several taxis at the service of tourists from airport to Pisa Central Station up to Piazza Duomo. The rate per person is set and a collective taxi can accommodate eight persons. Pisa is connected to Florence by frequent train services linking the two cities in about an hour. There are abundant trains in the Rome-Genoa lines as well. Intercity services are available from different locations like Florence, Rome and Genoa to Pisa Italy. Pisa can also be reached by road. First Published Date: Jun 29 2007 Last modified Date: April 25 2019 This page may have been updated recently as new information is available or the content may have been edited for better readability.